How do you like your eggs? I like mine at snack time, and this creation adds additional nutrients to already good-for-you eggs. 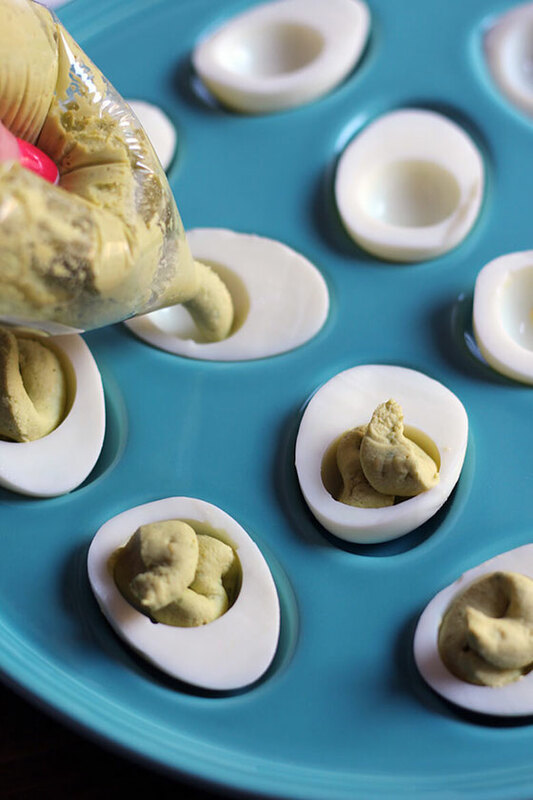 Who's ready for some deviled eggs? Thanks to the folks at The American Egg Board for sponsoring this blog post. All opinions, as always, are my own. If you didn't already know, I'm a big fan of eggs for breakfast and even lunch and dinner. I eat a lot of eggs, sometimes four a day! As a vegetarian, they're one of my main sources of protein. In fact, one large egg offers an impressive 6 grams of protein. This is high-quality protein, meaning it's easy for your body to utilize. Eggs also offer up the nutrient choline, which is really important for brain development during pregnancy—in fact, many would argue it's as important as folate! Choline may continue to positively impact cognition later in life, beyond the baby years. As part of its "How Do You Like Your Eggs" campaign, The American Egg Board wants to inspire people to break out of the ordinary and think of all the ways to enjoy eggs. Well, how do I like my eggs? Here's my answer: While I love eggs in traditional dishes like omelets, I also love to enjoy them for eating occasions beyond breakfast—such as snack time. 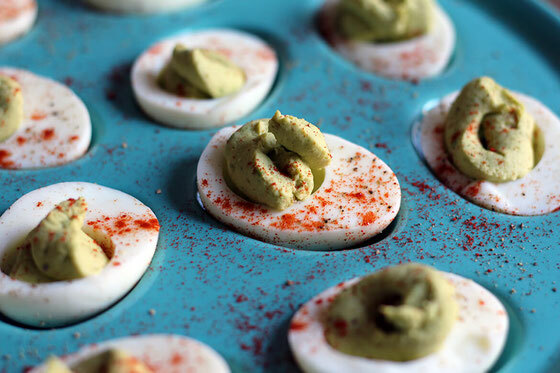 So I decided to bring one of my favorite snack recipes to you, which just happens to feature nutrient-rich eggs. 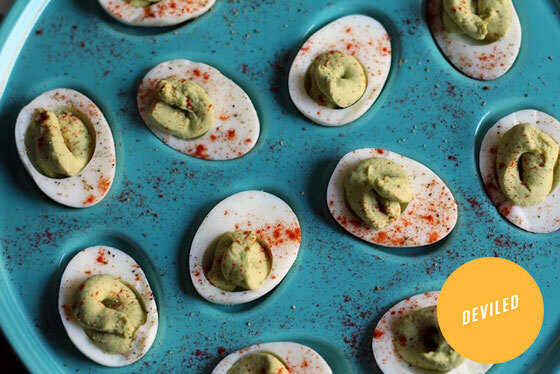 You've probably had traditional deviled eggs at least once or twice. Because I'm a registered dietitian nutritionist, I'm always thinking of ways to add even more nutrition to my favorite dishes. So I decided to add avocado, which features heart-healthy fats, as well as lemon juice, which contains additional choline. I made this recipe by combining hard-boiled egg yolks, avocado, lemon juice, Dijon mustard, salt, and black pepper in a food processor. Then I added the filling to hard-boiled, halved egg whites (see my tip below about how to create a homemade piping bag!) and topped the creation with black pepper and smoked paprika. You can eat these for a snack like I did, or you can serve them as an appetizer at your next dinner party. 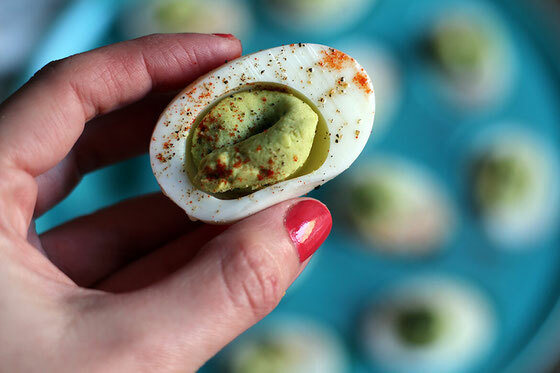 Ready to whip up these avocado deviled eggs? They are so easy and so delicious! 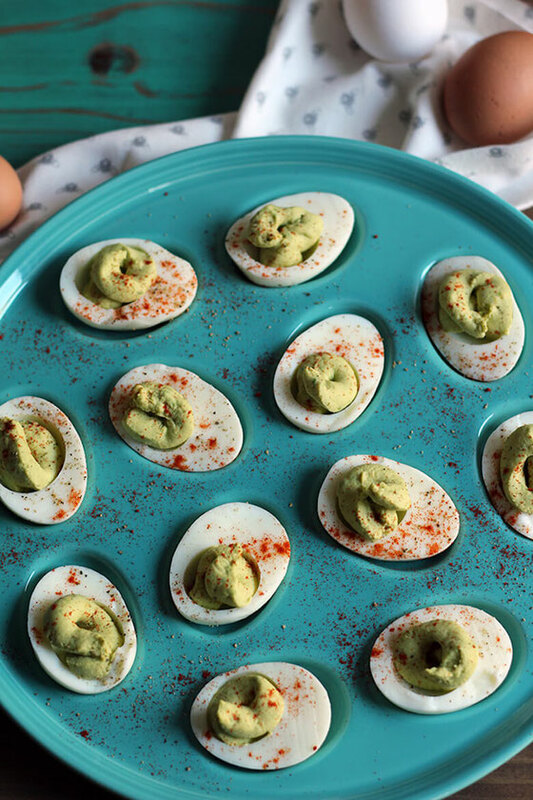 Get more egg-inspired recipe ideas from the Incredible Egg, too! Once eggs have cooled, slice in half lengthwise and remove the yolks. Combine yolks, avocado, lemon juice, mustard, and salt and pepper to taste in a food processor. Process until smooth. Add mixture to a zip-top plastic bag, cutting off a ¼-inch piece at the bottom corner. Pipe the filling into the halved egg whites. Dust with black pepper and paprika, and enjoy! Makes 20 deviled eggs. What are your thoughts on this topic? How do you like to eat YOUR eggs? Share here and also tell me on social media (I'm @amygorin on Twitter and Facebook and @amydgorin on Instagram and Pinterest), using #HowDoYouLikeYourEggs. Plus, watch my Instagram feed over the next couple of weeks—I'll be posting more unique egg recipe ideas! And don't forget to sign up for my newsletter to get weekly updates delivered straight to your inbox!